The Edge allows you to manage your data and make it work for you. Link together your Submission Log, Contacts, Phonesheet, and Talent Database. Generate reports from the linked data and automate your routine. See how it streamlines your entire office’s workflow. Quickly log incoming and outgoing calls. Keep track of who’s calling, what project they’re calling about, and what you’ve talked about in previous calls. The Edge allows you to keep track of phone calls, emails, meetings and submissions in the same record so that when you’re on the phone, you’re never at a loss for what to say. Click to email, or call from your online phone system. On your way out the door? 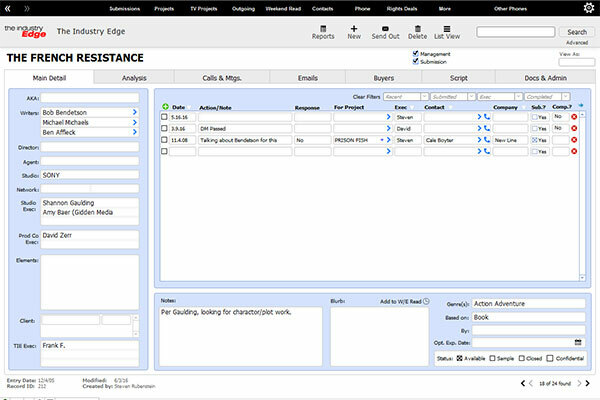 On the Edge, you can access your phonesheet from your BlackBerry or iPhone with our mobile application or simply by having your office email you an up-to-date phone sheet which will allow you to dial directly from the email. Keep projects organized and up-to-date. Create dazzling reports. Manage an unlimited number of script drafts, notes, and coverage. Maintain a list of roles and build a wish list of potential talent. 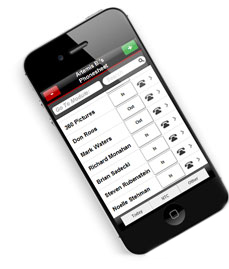 At-a-glance access to all pertinent phone calls and meetings. Track every action taken on a project. 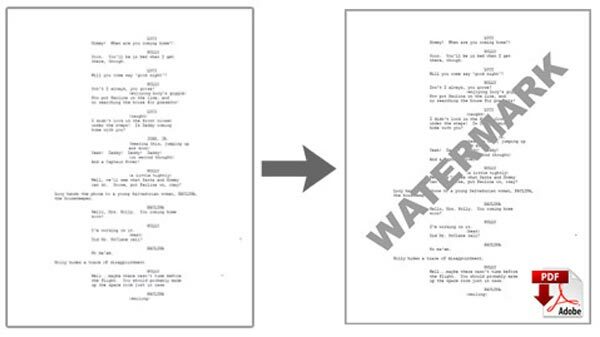 Log who the script was sent to, which draft it was, and when it was sent. Want to put that submission on the Weekend Read Report? Just click and it’s there. Set that spec up? Another click will transform it in your system and add it to your Project Database. Need to send your newest project draft to the agencies or the studio? A few more clicks and you’ve composed a cover email, attached the script and sent it on its way, all without leaving The Edge. On The Edge, your contacts are more than just phone numbers. You can keep detailed records not just of how to get in touch, but of how you met them, why they’re important, what they’re looking for and who they have a deal with. You can also jump straight to a list of incoming and outgoing submissions to any given contact, and remind yourself instantly of their active projects. If you want to know more, The Edge links you instantly to subject specific searches in Variety, Studio System, IMDBPro and Google. If you want to send an email or a submission, you can do it directly from The Edge. Contacts can be shared company-wide or marked confidential. 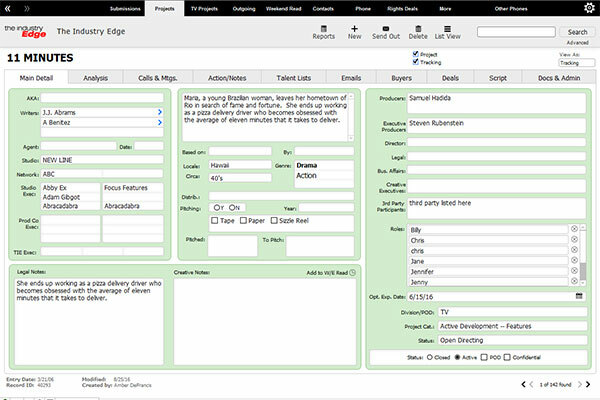 Maintain a database of actors, writers, directors, or any other craft. 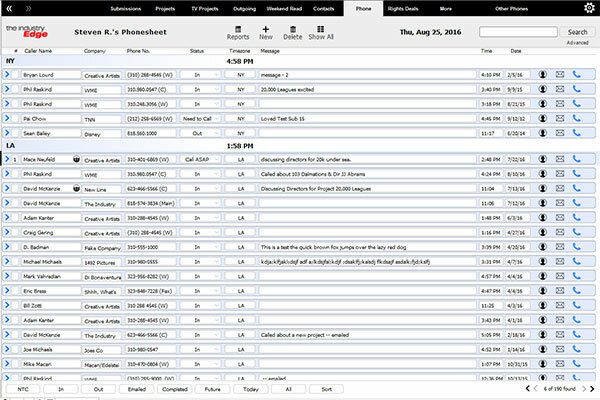 Take advantage of your robust talent database to generate potential talent lists for projects. Search writers by genre, actors by age, directors by availability, or any other craft by any criteria you can think of. 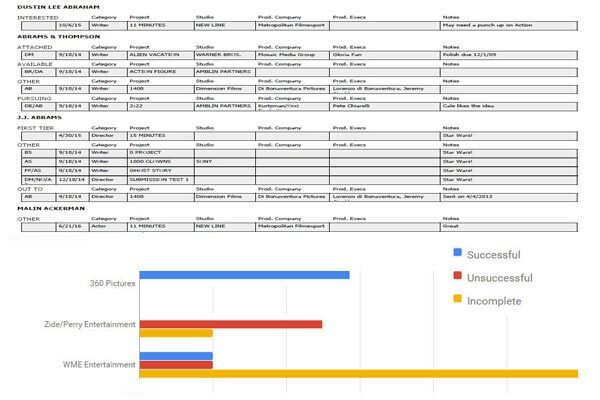 Create impressive talent reports that include credits, headshots, age, availability, and your personal prioritization with a few simple searches. Don’t spend hours racking your brain to create the perfect list of up-and-coming action writers for that hot project. Keep track of your clients and track their outgoing submissions. 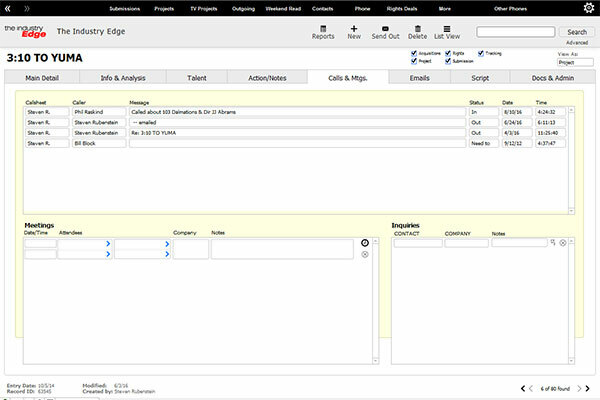 Everything you could possibly want to track for your client on one screen. Monitor their work samples, available material, and projects. Quickly see what you submitted and to whom you submitted it. Follow up on outgoing submissions and keep track of responses. Keep your clients happy with The Edge. Manage the flow of payments in and out of your company using the Edge. 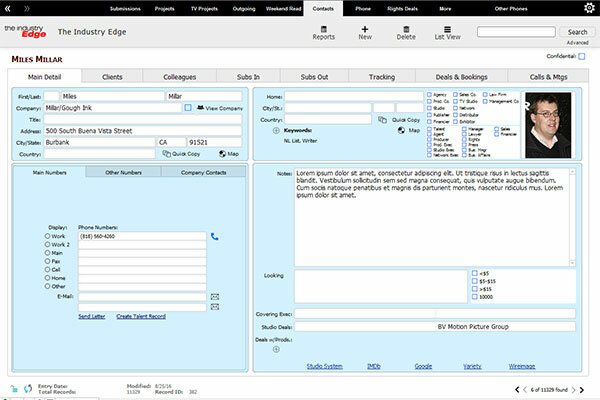 The Edge can keep track of all bookings and deals for rights, talent, and producing – break down each line item, link buyers with deals, link bookings on a project to project basis so that all accounting information is a click away. Keep on top of screenings and work the festival like a pro. 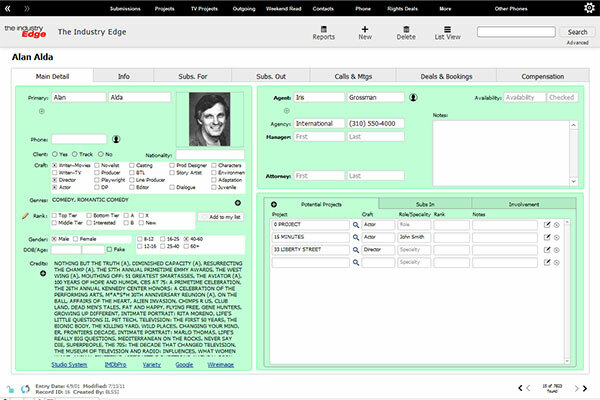 The Edge will become your an indispensable resource for tracking festival properties. Import the next big festival schedule into The Edge and print out beautiful books with info on every screening, what your biggest priorities are, who to meet with, and available territories. Don’t be caught unprepared. Sync your festival schedule with iCal, Google Calendar, Outlook, and Entourage. Keep track of on-going rights checks and monitor option expiration dates. Heard of a great book that might be available? Swoop in and grab the rights. Then, with one click, turn it into your next big project. 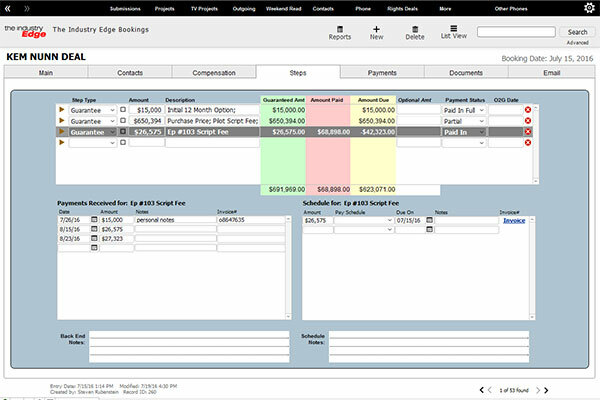 Manage the flow of Rights & Talent payments in and out of your company using the Edge. 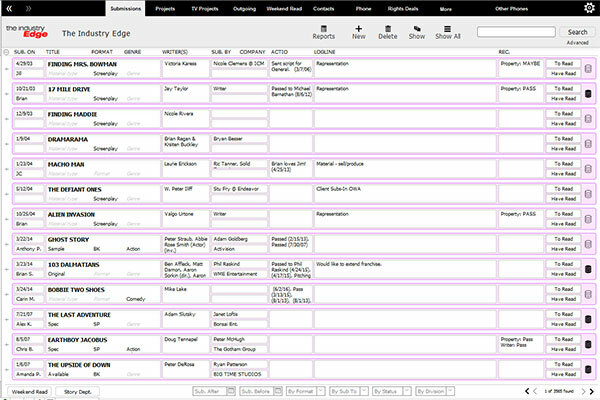 Keep track of all Rights or Talent booked through the Edge. Break down each line item, link buyers with deals, link Deals to projects so that all accounting information is a click away. Make your data work for you. Create detailed reports based on internal metrics based on data entered in to the Edge. 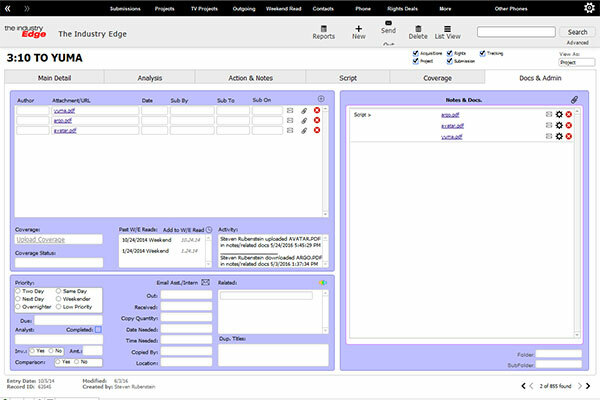 Generate and save Custom Reports based on information input into the Edge. Automate reports to send out every night, week, or month to keep all users informed of data input into the Edge. Keep on top of all Outgoing, Rights Expiration, and itemized Follow-Ups through Reminders on the Edge. Sent an Outgoing Submission? Create a reminder for you and your assistant to follow up with in a week. Have an Option Expiration date? Create reminders for you and others through the Edge. 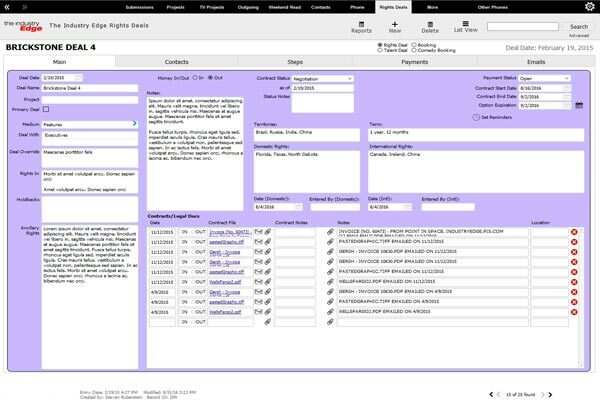 Need to send out a script or confidential information to perspective agents, managers, or buyers? The Edge now has the ability to generate watermarks on uploaded PDFs that are sent through the Edge. Share and restrict access to files sent through the Edge. Keep on top of the game with the Edge syncs. 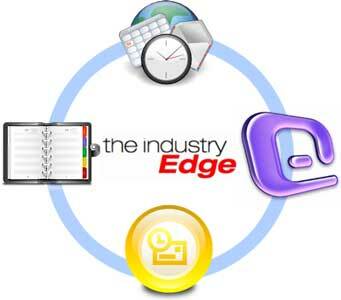 The Edge now has the capability to sync with a variety of business driven applications. Always on the go? The Edge has you covered. Use the Edge App or Edge web based custom solution so that your data is at your fingertips; anytime, anywhere.